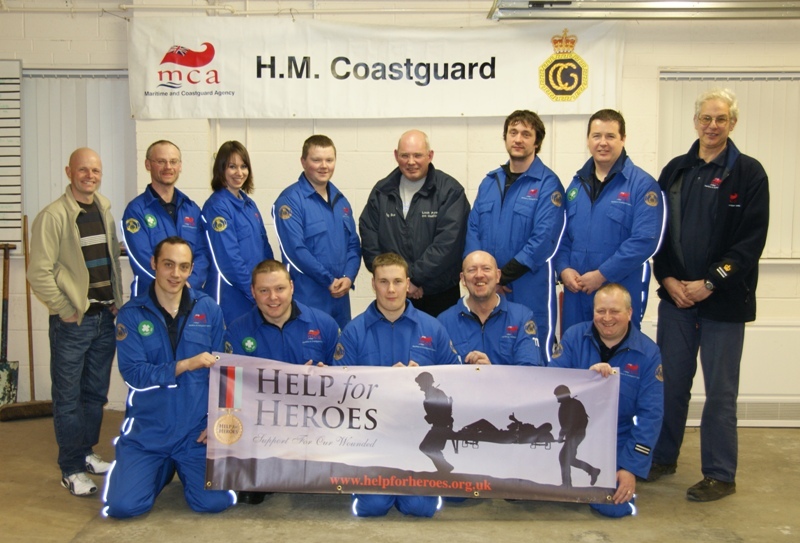 Whitby Coastguard team is putting its best foot forward by climbing 4.400ft Ben Nevis for forces charity Help For Heroes this summer. Organiser Steven Bunt said: All team members are passionate about this cause and are proud of the armed forces and their commitment to their country and the sacrifice they make. Coastguard member Eve Murphy and the team will be placing a wreath on the summit of Ben Nevis in memory of all fallen service personnel. Whitby Coastguard team have already started their training ready to scale the highest mountain in the UK, having just completed a nine mile hike from Saltburn to Staithes. They will be doing regular training to prepare and are all excited at the prospect of the challenge, which is set to take place on Saturday 31 July 2010. The team members have set a target of £4.000 which they hope will be reached in a number of ways and invite you to help them by sponsoring a team member and / or acquiring a Help For Heroes wristband for a small donation. They will be doing regular fundraising events over the next few months, including supermarket bag packing during April and May. Mark Hunter, Steven Bunt, Anthony Hunter, Steven Broadhurst and David Brighton. A number of local schools have offered to do non uniform days and other events to raise money and they have also received offers of support from local businesses, all those taking part will be presented with a "Certificate of Appreciation." It gives me great pleasure to be able to update this page with news of the successful climb. The 11 volunteers and friends scaled the highest mountain in Scotland, Ben Nevis which stands 1,344 metre (4409 feet) in July and hope to have raised £3,000 of the Help the Heroes charity. The climb was completed in a breathtaking three and a half hours, Coastguard member Steve Bunt said "We started the climb at 7 am on the Saturday. It was a bright summer's morning, a perfect start to the day. The scenery around Ben Nevis is stunning and the higher we climbed it got only better. However, when we hit the cloud base which is about 3.000 ft visibility went from good to poor, we couldn't see much at all." "It was hard going but we all got a great sense of achievement when we made it to the top. The weather on the summit was very cold, it had been described as sub Arctic with an annual temperature below freezing. We then made our way back down the mountain cold and wet but overjoyed with what we had achievement. The whole climb from start to finish took six hours." On the 15th August the Whitby Coastguard unit organised a 60's / 70's disco and charity auction fund raising event to raise funds for the "Help the Heroes" charity. Many local businesses donated gifts for the auction including meal vouchers for Whitby restaurants, beauty products, as well as a £100 jet washer and an England football shirt signed by the team two worthy prizes indeed!